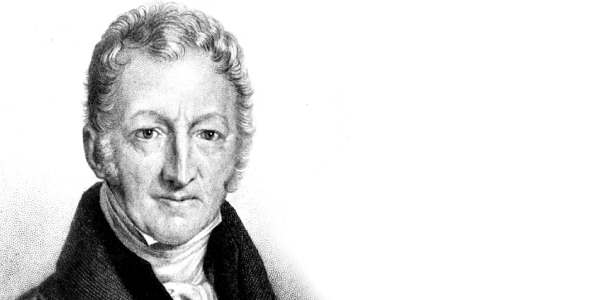 Malthus is long dead, but his ideas live on and are still widely debated today. Massimo Livi Bacci argues that he was probably right, after all. Concise and clear, Malthus wrote in the first chapter of his Essay: “Through the animal and vegetable kingdoms, nature has scattered the seeds of life abroad with the most profuse and liberal hand. She has been comparatively sparing in the room and the nourishment necessary to rear them. The germs of existence contained in this spot of earth, with ample food, and ample room to expand in, would fill millions of worlds in the course of a few thousand years”. Nothing new under the sun: in modern times, two centuries before Malthus, Botero had written similar words and Ortes, the bizarre venetian clergyman-economist, acknowledged that geometrical growth is impossible, because it would lead mankind to “grow not only beyond the number of persons that could breathe on the earth, but to such a number as could not be contained on all its surface, from lowest valley to highest mountain, crowded and crammed together like dried dead herrings in their barrel”. So, for both Ortes and Malthus, and for a score of other writers and, indeed, for everybody with a minimum of common sense, the ultimate limit to population growth is space (or land). Because cultivation depends on land, and so do pastures, cattle raising, hunting, and energy, and all material resources for manufacture, and – above all – subsistence. Centuries ago, the lack of space was a remote threat in a vast, largely unexplored and uninhabited world. But in our times, the limitations imposed by the finite space of our planet are becoming visible at the global scale. Let us suppose that mankind is subdivided into biologically and demographically sustainable groups (communities, clans, tribes, etc. ), each one composed of 1,000 inhabitants. Let us call these abstract groups demoi, and let us imagine that 10,000 years ago, at the time of the “invention” of agriculture, 6 million people were evenly distributed across 6,000 demoi. Each demos would have had, on average, an endowment of land equivalent to the surface of Sardinia (22,333 sq.km). Plenty of land, by all means, for 1,000 humans. By the beginning of the Common Era (birth of Christ), the endowment of each of the 250,000 existing demoi would have shrunk to the size of Ibiza (536 sq.km), while at the start of the industrial revolution (around 1800), it would have been the size of Milos (151 sq.km), in the Aegean Sea, (blessed by the statue of Aphrodite which now welcomes visitors at the entrance of the Louvre), which measures only 15 km by 10 km. Three centuries later, in 2100, each demos’ land endowment will be about the size of minuscule Capri (10.4 sq.km), whose renown is incommensurably greater than its size. Population dispersion and growth have determined a gradual process of anthropization of the planet. A recent study makes use of the increasingly precise data that is now available thanks to high-definition satellite imaging. It estimates that agricultural and forest cultivation covers some 47% of the earth’s land area, with around 13% devoted to arable use and permanent cultivation; 26% covered by permanent pastureland and meadows; and around 8% more comprising areas subject to deforestation, or which have been artificially replanted. But to this 47% we must also add the other spaces in which human action is radically changing the face of the Earth: the 3% of land surface devoted to urban areas, another 3% to various types of economic activity, and a further percentage point to infrastructure (roads, ports, railways) and mining activities. The total area directly used or transformed by human activity thus accounts for more than half the Earth’s land area (54%). As for the remaining ‘natural’ areas, 28% of total land is covered by woods and forests, while 19% cannot be turned over to agriculture or other human uses because it is frozen, desertic or situated in high-altitude mountain areas. And even these areas are not totally natural, since they too may be affected by human activities through contamination or global warming. In conclusion, three intertwined global processes are at work: (i), population growth and dispersion; (ii), occupation and anthropization of space; (iii), increasing unfitness of the remaining “pristine” or “semi-pristine” land for human settlement and activities. In the very long run, an additional human, occupying an additional unit of space, will settle in an increasingly inhospitable setting. In other words, the “quality” of that marginal unit of space is declining while the “cost” of occupying or settling it is increasing. It is true that the real world is subject to a plurality of forces, and that adaptation, human ingenuity and technology may sometimes do miracles, but the general (human, social, and economic) cost of settling additional and increasingly inhospitable spaces is tending to increase and represents the “real” limit to population growth. Similar reasoning can be applied to marginal units of land exploited to produce subsistence or mineral resources and that yield diminishing returns. 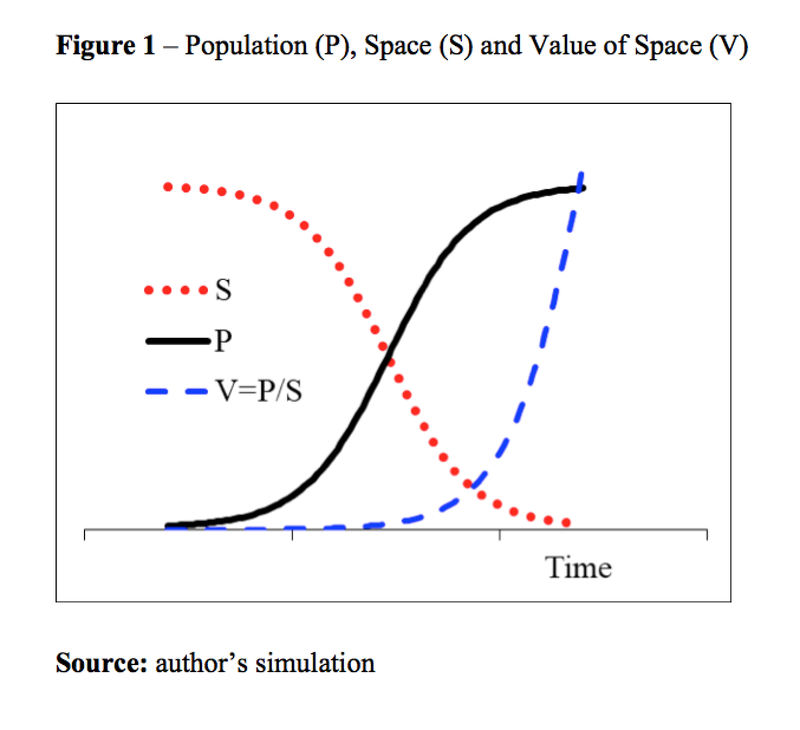 In Figure 1, where the population P increases following a logistic curve, while space in pristine conditions S declines in parallel (following an inverted logistic), a proxy for the value V of the marginal unit of land could be the ratio between the two. This value, in this abstract paradigm, is close to zero at the onset of agriculture, and grows exponentially as population increases and available space declines. Thomas R. Malthus, An Essay on the Principle of Population, Penguin Books, Harmondsworth, 1970, pp. 71-72 (1st edition 1799). Author’s italics. Giovanni Botero, Delle cause della grandezza delle città, 1588. Giammaria Ortes, Riflessioni sulla Popolazione delle Nazioni per Rapporto all’Economia Nazionale, in Pietro Custodi, Raccolta degli scrittori italiani di Economia politica, vol. XXIV, Milan, 1804, Chapter 1. Roger LeB. Hooke, José F. Martín-Duque and Javier Pedraza, ‘Land Transformation by Humans: A Review’, GSA Today, December 2012. I am less certain about this last assumption, since modern extractive technology now extends to regions that were once beyond reach, like the Arctic and Antarctic zones. Or, more correctly, it is the pressure that the existing population exerts on the residual space.